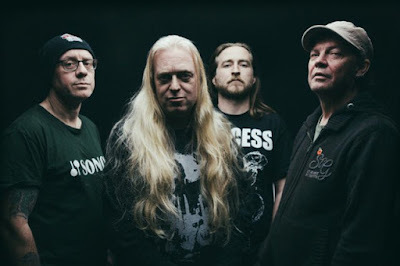 Home » » Interview - MEMORIAM - You could say that Memoriam were formed as a tribute to the memory of Martin Kiddie Kearns. 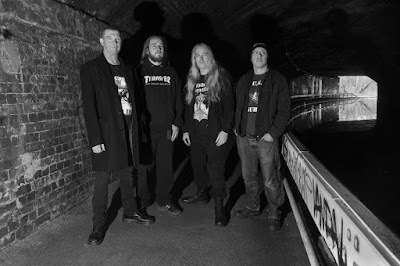 Interview - MEMORIAM - You could say that Memoriam were formed as a tribute to the memory of Martin Kiddie Kearns. Interview with death metal band MEMORIAM. Ave MEMORIAM! I listen to your new album „For the Fallen“over and over and I cannot „get it out of my head“! I think that it is very good. How do you feel about the album when some time has passed? How are the fans´ reactions? How about reviews, critics? 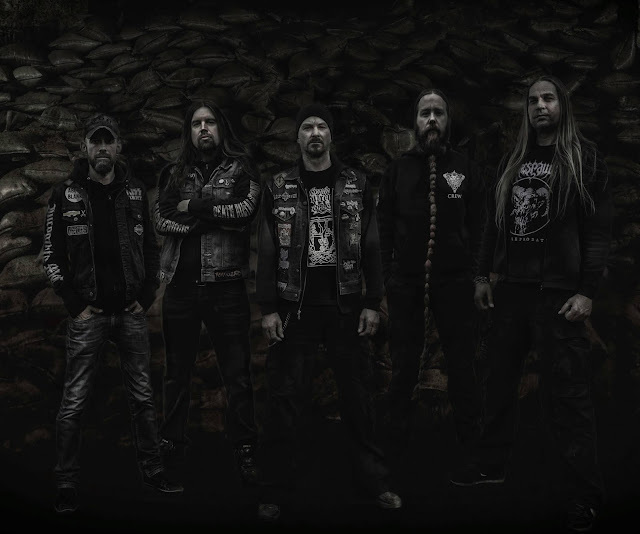 We are really please with the reaction that For the Fallen has received across the world, of course there are a few critics out there that do not like it because it is not like Bolt Thrower or Benediction., but you can’t please everybody and it was never our intention in the first place to make an album that sounded exactly like Bolt thrower or Benediction. We try with Memoriam to create our own sound and identity. Your great cover was done by Dan Seagrave. How did you choose the motive? Did Dan hear any songs for inspiration? Personally, I have not seen a better cover for a death metal album this year so far. We are totally chuffed with the album cover, Dan has created a fantastic piece of artwork from the brief idea that we gave to him. We sent over the demos of the songs we had recorded along with a list of song titles and told him we wanted an ethereal funeral procession marching across a devastated landscape – and that’s exactly what he did! 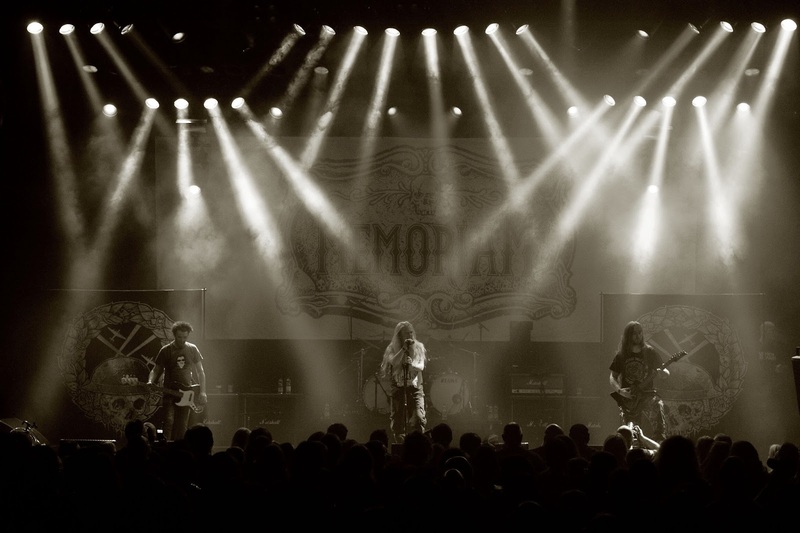 How do MEMORIAM compose new songs? How is the process when you create a new material? Who is the author of your music? Scott comes up with all of the riffs – he usually sends them to us by email on mp3 format with a basic structure to a song – we then pick out the bits that we really like and when we get into the rehearsal room that is when we pull it all together. Frank is really good and has had plenty of experience structuring songs and we know what works well. Once the basic structure is in place along with Whales signature drum style I take it away and work on the lyrics and the song title. It is a fast process. Who is the author of your lyrics for “For the Fallen” and what are the songs about? Where do you find inspiration? I write the lyrics to the songs – I draw my inspiration from direct experience of the world around us. There is always going to be a large amount of inspiration from the eternal subject of war, this is something I have always done and intend to continue to do so. However with Memoriam there are more political elements within the lyrics along with the topics of death, sorrow and mourning which is how the band was formed when we started out. The sound of “For the Fallen” was done by your guitar player Scott Fairfax. I like that you sounds cold, ashy and at the same time it is readable. It looks like Scott did a great job. I was wondering how the new album was created. Were you able to talk about the final sound and have some comments? Did you want to try a different sound master who would see your music with a wider perspective than Scott who is more involved? We are pleased with how the album came out for us, it is a document of the time, and Scott worked hard alongside the producer Ajeet @ Hellfire Studios. It only took 2 weeks to record, mainly at weekends at on the evenings due to our work and family commitments. But it took a lot longer to mix the album to get it to how we wanted it to sound, around 4 weeks mixing in total. You play a classic “old” death metal. You have never change, you are “orthodox”. Personally that is one of the reasons why I like your work. But have you ever thought about doing something different, to spice MEMORIAM a little bit? We have tried out some new ideas with Memoriam such as introducing samples which help to fill out the dynamics, as we are a 4 piece band. That is something I have never tried before. But generally speaking we tend to stick with what we know works well for us. I have seen so many bands experiment with new sounds over the years and ultimately it tends to dilute what they are doing and also alienate the people that support them, Memoriam will be sticking 100% to its old school death metal roots! 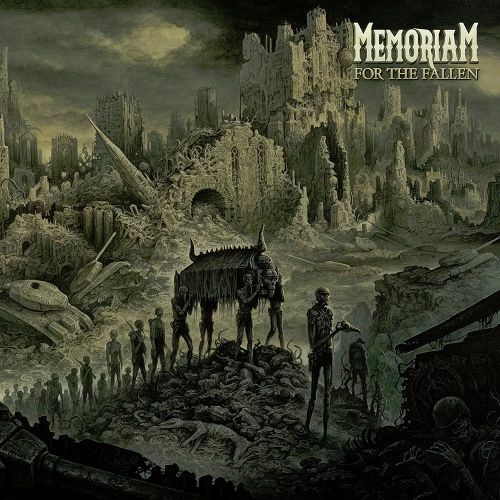 The new album “For the Fallen” was published on vinyl. How about you and vinyl? Are you a collector? Do you have a wide collection? Some bands sell more vinyl than CDs. How about you? I used to be a huge collector of vinyl, I come from an era before there were CD’s and always have preferred the tactile nature of Vinyl, the album cover has always been a thing of great importance to me, the design of the cover of For The Fallen had this in mind. I love the sound quality of vinyl, even the small scratches which give each piece of vinyl its own identity. However I had to sell all my records a few years ago when I fell into financial difficulties (children are expensive things to have!). I no nothing of our sales at this point so could not say if Vinyl has sold more than CD – but the amount of variations that NBR have released in vinyl it would not surprise me! Let’s look back a little bit…what was the main impulse for founding a band called MEMORIAM? Well basically Memoriam was formed at the end of 2015. Following the tragic loss of Martin Kiddie Kearns in September 2015 Bolt Thrower decided to put the band on hold indefinitely. I spent a few months deciding what I wanted to do with my life and decided that life is too short to sit around waiting for others to make decisions – so I decided to form a new band with my old mates Whale the former drummer of Bolt Thrower and Frank from Benediction. We really just got together initially to have some fun and try to get some enjoyment back into our lives and it all grew from there. You could say that Memoriam were formed as a tribute to the memory of Martin Kiddie Kearns. You sing and play about wars. Sometimes the topics are quite controversial and historically disputable. Has it ever happen to you that you had some problems because of that? Have you ever been abandoned to play, been accused of militarism, or something? Yes, war has been a constant theme and a source of lyrical inspiration throughout my career as a vocalist in a Death Metal band! But I have always approached the subject matter from a psychological perspective, I have never stated that war is good or war is bad – it is just a symptom of human nature. I have never been interested in writing too much about the blood and gore aspect of war but more about the way in which affects people. So I have never really had anyone dispute my lyrics as there is nothing really to dispute. The only time we had to cut a set short was back in 1992 on tour in the USA with Bolt Thrower when the gig was disrupted by Nazi skinheads. What about historians, fans, and so on? Have they ever had some comments about your lyrics which were for example incorrect, that you founded information from “wrong sources”? Or maybe some veterans talked to you about it? As stated previously I do not really dwell on factual detail about war but seek to examine the effects it has on people. I have had a lot of academic military historians contact me that are into the music and the lyrics we create. The same with members of the military forces from across the world and also people that have actually been within war zones that have found that our music and the lyrics I have written a way to help them through the situations that they have experienced. Your band is full of celebrities. Every single one of you is an artist who wants to express himself into the music. Has it ever happened to you that you had different opinions during recording? Do you fight? Who has the last word? The term Super group really makes me laugh – we are just 4 mates making the music that we enjoy playing together, there are no egos within our band and we really look forward to getting together once a week in the rehearsal room to practice the songs we have written and create new songs. At our stage of life we are al very grateful for the opportunity to do this. We all have disagreements about the ways some things are done, but we are experienced enough to work it out together as friends That is what Memoriam is all about – a celebration of life through Death Metal! How do you put together concerts? All of you play in different bands. Who wins when the dates are not working out? And, of course I have to ask, do you want to go to the Czech Republic? At the moment we are all totally focused 100% on Memoriam – so that is not really an issue at this point. What are Memoriam’s plans for the next few months? Do you prepare a new material for a new album? We are fairly busy throughout the summer up till the end of September playing at a lot of European festivals along with a few club shows also; we intend to go into the studio to record our 2nd album in October 2017, we are currently in the process of writing this right now. We already have 4 new songs that we are working on, 1 of which we have started to play live which is called ‘Nothing Remains’ which is primarily about Dementia, something that my mother has and has had a massive impact on my life. Thank you so much for this interview and I wish you as many wins on death metal fields as possible. I wish you many sold out CDs, hundreds of crazy fans and tons of great ideas. And I also wish you a good luck in your personal lives.